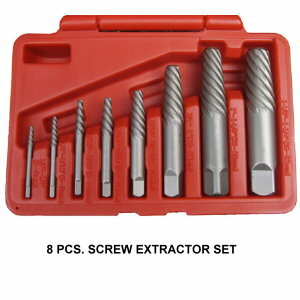 Per Wikepedia, the screw extractor was invented in 1940s by a Mr. Hanson in USA. 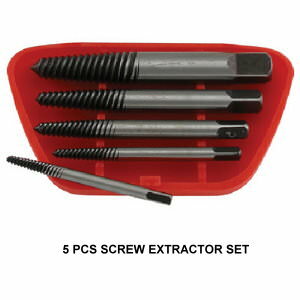 A screw extractor is a handy tool being used for removing expressly the broken or seized screws. A spiral screw extractor is itself a coarse-pitched tapered screw thread, so called Easy Out. They are left-handed, for use on right-handed threades. The screw is first drilled out to the proper diameter for that extractor. The extractor is then inserted into the hole and turned counter-clockwise using a tap wrench. As the extractor is turned the flutes on the tool dig into the screw, pushing it to lock tightly and apply enough torque to remove the screw.